Flagellin is a bacterial protein that activates the innate immune system. Its name comes from flagella, the whips many bacteria use to propel themselves. On Thursday, a team of researchers led by immunologist Andrew Gewirtz reported in ScienceÂ that treatment with flagellin can prevent or cure rotavirus infection in animals. Rotavirus infection is one of the most common causes of severe diarrhea and is a major cause of death for children in developing countries. 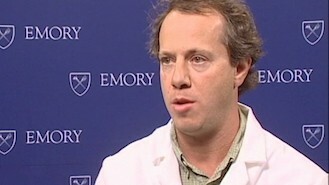 Gewirtzâ€™s lab is now at Georgia State, but he and his colleagues initiated this research while at Emory and several co-authors are affliliated with Emory, including immunologist Ifor Williams. For me, what was most surprising about this paper was that treatment with flagellin, or immune signaling proteins activated by flagellin, can get mice with severely impaired immune systems â€“ no T cells or B cells at all — to evict rotavirus. These are mice that have to be reared under special conditions because they are vulnerable to other infections. Interferons, well-known antiviral signaling molecules, are also not involved in resisting or evicting rotavirus infection, the researchers found. Indirectly, flagellin appears to stimulate intestinal epithelial cells to become more virus-resistant, the researchers found. Gewirtz says his team is investigating whether treatment with flagellin (or IL-18 and IL-22, the molecules it is acting through) may be helpful in fighting other viral infections such as norovirus. Although vaccines against rotavirus are available, they have been less effective in developing countries. A NIH virologist quoted in ScienceÂ says Gewirtzâ€™s findings may explain why: children in developing countries may have been exposed to more flagellin and their cells might destroy live-virus vaccines before theyÂ can fully stimulate immunity. Genetics and viral strain mismatch may also affect the vaccinesâ€™ efficacy, recent research suggests.